Eindhoven, The Netherlands - Plextor, a leading developer of high-performance digital storage equipment, announces the M5M mSATA 6 Gb/s JEDEC MO-300 SSD. Highly compact and light weight, the drive puts the high-performance and high-reliability of Plextor’s multi-award winning SSDs into the thinnest ultrabook laptops and tablet PCs. 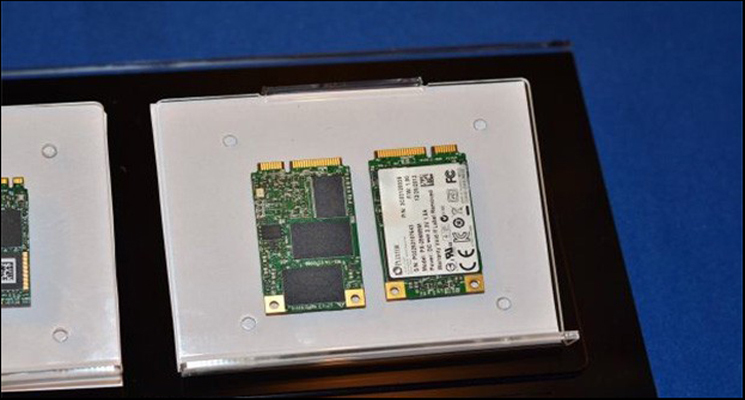 Powered by the latest Marvell 88SS9187 controller, the M5M mSATA SSD has a maximum sequential read speed of 540MB/s, a write speed of 430MB/s, and random read/write speeds of 80K IOPS/77K IOPS. Supporting the SATA DEVSLP standard it enables longer battery life with an incredible DEVSLP power consumption of 1 mW. Thanks to extensive testing during development and Plextor's strict manufacturing standards, the calculated mean time between failures is an impressive 2.4 million hours. The new compact M5M is designed specifically for ultrabook and tablet PC devices enabling them to maximize system performance and responsiveness through ultra-fast storage performance. The M5M delivers equally high speeds for all data types through the use of the Marvell 88SS9187 controller. True-Speed technology prevents long-term slowdown by automatically returning drive speed to like-new levels after periods of intense use. This combination of the latest server grade controller and True Speed gives M5M users unequalled long-term real-world performance. The speed of the new M5M is complemented with high efficiency including support for the DEVSLP standard. In the Device Sleep state, the drive uses a mere 1 mW and resumes in 100 ms, and in operating mode it uses less that 10% of the power of a typical hard drive. This gives users significantly longer battery life especially when used for any storage-intensive application. The M5M features True Protect double-data protection technology. This exclusive system includes multi-layered data integrity checking with automatic 128-bit error correction and Plextor’s unique firmware based Robust Data Hold-out Algorithm to ensure 100% accurately for long-term data storage. True Protect also offers full data security through the use of the highest level of AES full-drive encryption, 256-bit which is performed by the M5M’s US Government AES-validated Marvell controller. Prior to manufacturing during development, the M5M underwent extensive testing. The 500-hour 400 drive tests included: a 48-hour sustained read/write test, 4000 times sleep and hibernation test, 250 power cycle tests. The pass requirement for each test was zero errors. Reliability is extremely high with a calculated mean-time between failure for M5M being 2.4 million hours. Every individual drive is also subjected to rigorous burn-in testing and accelerated usage simulation ensuring maximum stability. The M5M’s dimensions are: 50.8 mm (2 inches) x 29.8 mm (1.17 inches) x 3.6 mm (0.14 inches). It weighs 9 g (0.32 ounces). It is available in 128 GB capacity with recommended end user price of £ 94.99 (including VAT) and comes with a three-year warranty. Later this quarter a 64GB and 256 GB version are expected to become available as well. The 128GB version of the M5M is available now for pre-order at Scan.